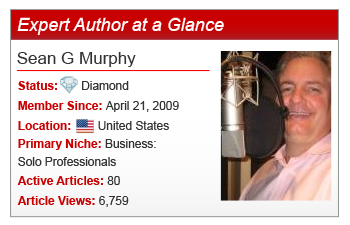 In April 2009, Expert Author Sean G. Murphy wrote his first article simply to see if he could do it. Surprised by his success, Sean was motivated to continue writing based on the positive response from readers who conveyed their gratitude for his articles. Although he claims to not be “the best writer,” Sean provides a conversational tone that’s engaging while maintaining informative value. To further hone in on his audience and their needs, Sean stays in tune with current trends via Facebook, his family, and other forms of media. Inside the Actor’s Studio, for instance, inspires him to expand upon profound interviews. Even Sean’s 8 year-old son inspires him to keep it simple because “everything we needed to learn we learned in kindergarten,” he said. Discover your article writing power by trying out Sean’s strategies and let go of seeds of doubt to cultivate your own international recognition! Do you have a question or comment for Sean? Feel free to leave it in the comments section below. On My.EzineArticles.com? Add Sean to your Network! Hi Sean, congrats on the publicity. You’re certainly no beginner to EzineArticles, and it’s good that your articles has brought you lots of credibility. Once again congrats! Hi Sean congrats for such a good achievement. Looking forward for a worthy initiative in future. You have pointed out something that I find invaluable at ezinerarticles.com. They track the results of your articles and each month they list the 3 top articles. I have written about love, loving relationships, healing, success, body therapy, nutrition, dieting, health, healing, marriage, relationships, spirituality and sexuality. Since 2008 I have posted 239 articles on all these different topics and only a very few on specific aspects of sexuality. Yet, the 3 most prominent articles in all this time have been the articles I wrote about Male Sexual Arousal, Foot Fetishes, and Cheating. What that reveals to me is that there is a huge need out there for me to write articles that specifically help individuals struggling with these and similar very sensitive and not much talked about topics. As much as I love to write about love, people who are struggling with personal issues are also struggling with love.